Brunner, Lake, Trout Fishing – Where the trout die of old age! Dan Sweeny with a dark coloured brown trout taken at Lake Brunner while fishing with local guide Brent Beadle. Note the typical colouration of fish from Westland lakes. Photograph courtesy of Brent Beadle’s Moana Trout Fishing Safaris. Lake Brunner (or Moana-Kotuku) is situated on the main highway between Canterbury and Greymouth via Arthur’s Pass, in the South Island of New Zealand. Lake Brunner trout fishing is consistently good, as is the fly fishing in the Orangapuku and Crooked Rivers. A boat or kayak greatly improves access, particularly when the lake level is high following heavy rain. 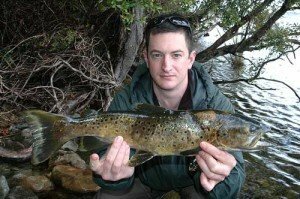 There is a lot of excellent brown trout water to be fished in Lake Brunner, as well as the much smaller nearby Lake Poerua, and the outflowing Arnold River – a premium brown trout fly fishing water. Brunner is a large lake being some 10 km across at its widest point. Lake Brunner is also quite deep (over 100 metres in parts) and drops off rapidly around much of the shoreline. Set in spectacular bush-covered mountains it is a scenic delight. Lake Brunner is named after the European explorer Thomas Brunner who came upon the lake after travelling up the Arnold River in 1847. The name Lake Brunner was bestowed by John Rochfort. The Maori name for Lake Brunner is Kotukumoana or Moanakotuku. A typical butter-coloured Lake Brunner brownie weighing around 1.1kg before release. It was taken drifting and casting close to the willows. 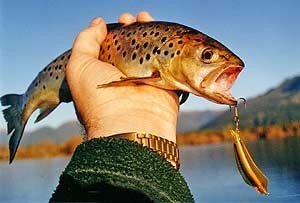 The fish population is mostly brown trout weighing between 1 – 1.5 kilogrammes. Big fish weighing above this are rare. Perhaps the very large numbers of these smaller fish create excessive competition for food preventing fish reaching their growth potential. Lake Brunner contains mostly brown trout but there are some rainbows too. Take a look at the comprehensive West Coast Fish and Game access brochure. The water is tea coloured from the dense bush that surrounds the lake and its catchment rivers and streams. The buttery colouration of the browns matches the water colour well making them hard to spot from the lakeshore or river banks. As such blind fishing is the norm. This big lake is popular with yachties and power boaters. Over the summer months, groups will often set out by boat from the camping ground and hotel at Moana for a day’s picnic on a distant secluded shoreline. There is also good motel accommodation available at Moana. Pete Moore caught this solid looking brown trout close to Lake Brunner while fishing with local fishing guide Brent Beadle. Note the beautiful butter colouring typical of South Island West Coast brown trout. The tannin in the water from bush run-off can make it hard to spot fish. Sometimes the water appears almost black in poor light. Photograph courtesy of Brent Beadle’s Moana Trout Fishing Safaris. Trolling and harling are also popular and productive. A Woolly Buggar fly is usually effective in olive green, grey, or brown. A brace of two good size brown trout caught in Lake Brunner. Photograph: Allan Burgess. The best spots are close to the willows of Howitt Bay, Iveagh Bay, and off the Orangapuku and Crooked Rivers. Troll close to shore within 20 metres of the bottom. If fishing a downrigger set the release clip pressure low so that the smaller browns can pull the line free. When harling a lead-line also be aware that the strike from smaller fish may go unnoticed. I have also had success drifting in close to the beech trees and casting green and gold Cobras and Tassie Devils. MetService weather forecast for Greymouth (24 km from Lake Brunner). 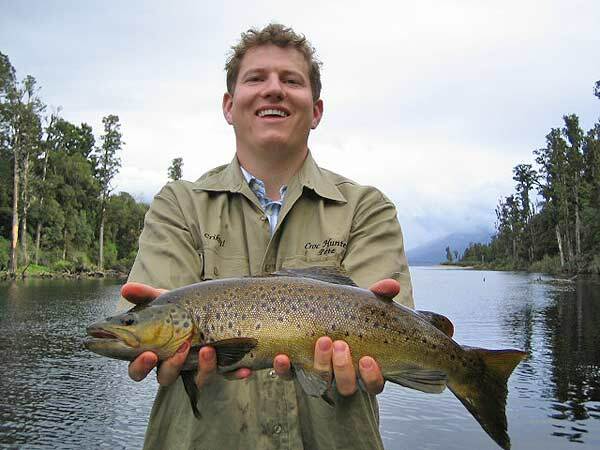 A magnificent brown trout taken from Lake Brunner by Dan Sweeney during a fishing trip with local guide Brent Beadle. Lake Brunner trout fishing produces some great fish! There is good access to the shoreline of Lake Brunner for fly and spin fishing provided the lake level is low. It is surprising just how high the lake can rise following heavy rain. Sometimes water even covers the jetty at Moana! Panoramic view of a brooding Lake Brunner with low cloud covering the top of Mt Te Kinga in the distance to the left of centre. The Arnold River flows out of Lake Brunner at the right of the picture. Trains carry West Coast coal over the railway line at left for export at the Port of Lyttelton. 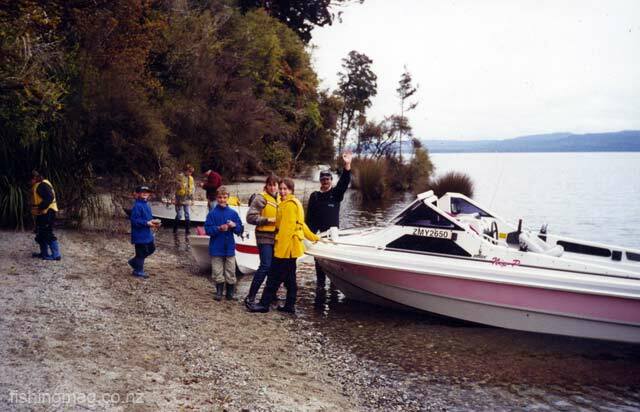 Lake Brunner offers very good fishing. 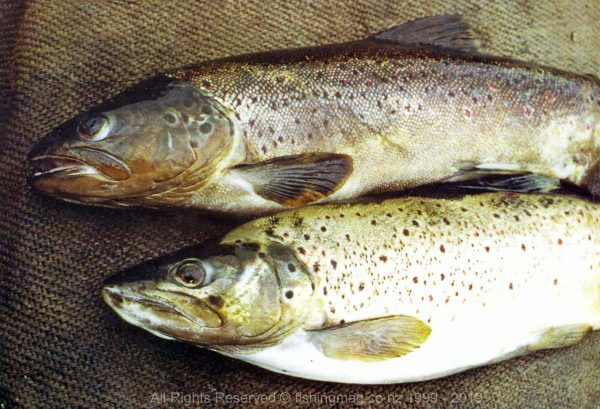 Though the butter coloured brown trout don’t seem to grow much beyond 3-4 pounds there are plenty of them in the lake and surrounding rivers. There are several excellent fishing guides resident at Moana. Trolling is popular and productive, particularly at first light. The Arnold River flows out of Lake Brunner at Moana joining with the Grey River at Stillwater some 28 km (as the crow flies) away. This is justifiably one of New Zealand’s best trout waters. Though there are plenty of fish again they are difficult to spot in the tea coloured river. I have spent several wonderful evenings with the fly rod and light spinning gear fishing the Arnold near the lake exit. The brown trout are around 1.2 kg, very quick and inclined to jump! Lakeside lunch at Lake Brunner. Photo: Lex Coutts. Accommodation: Lake Brunner Country Motel & Holiday Park offers Cottages, Cabin Lodge, Campervan/Caravan Park & tent sites near Moana (just 2kms from Lake Brunner). Lake Brunner Motor Camp Holiday Park accommodation in Moana, Westland with a view of Lake Brunner. Lake Brunner Lodge. Located on the shores of Lake Brunner. 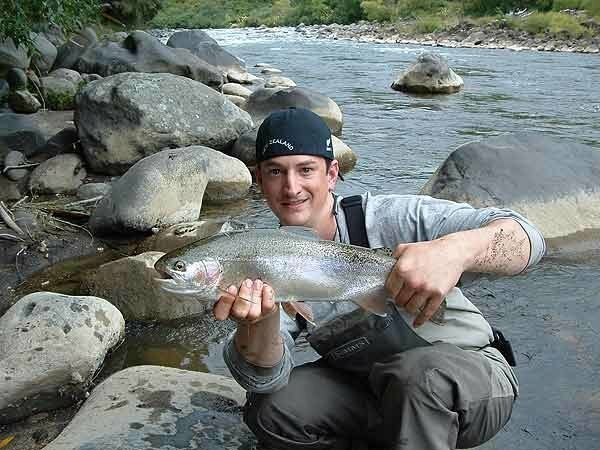 Dan Sweeney with a fat looking rainbow trout taken near Lake Brunner. It seems this well-conditioned rainbow hen fish was taken in one of the rivers flowing into Lake Brunner: the Orangipuku, Hohonu or the Crooked River. Possibly the water might also have been the outflowing Arnold River! As you can see from the accompanying photographs Lake Brunner trout fishing is a bit out of the way but the travelling angler can be well rewarded. 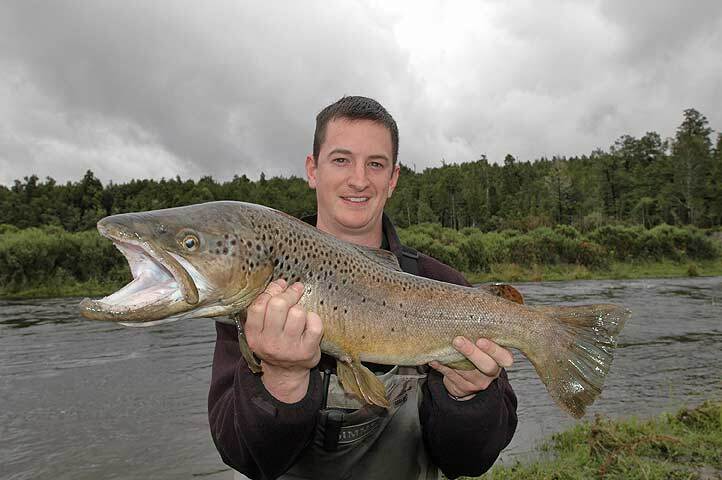 There are some big trout in Lake Brunner, its tributaries, and in the out-flowing Arnold River. However, I’m sure it would take expert local knowledge to catch one of these bigger fish! Brent Beadle has vast experience fishing Lake Brunner and the surrounding area. Lake Brunner Lodge Bed and Breakfast, trout fishing destination and environmental retreat. 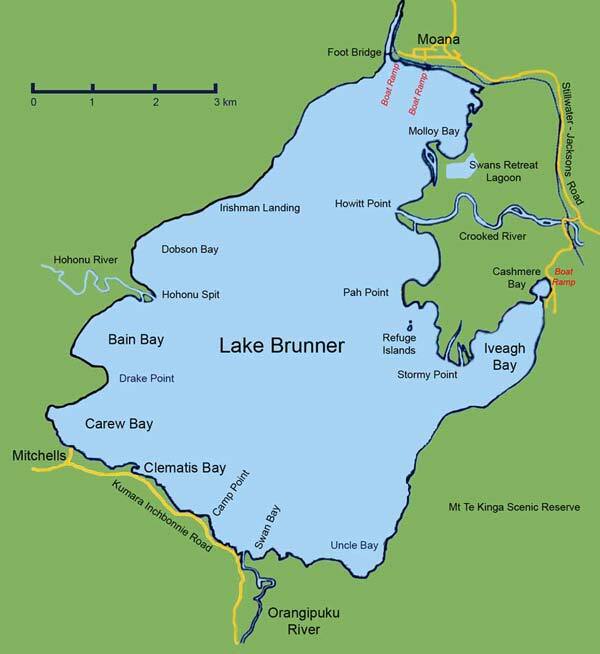 Lake Brunner trout fishing map. Lake Brunner with some of the “Top Spots” marked. 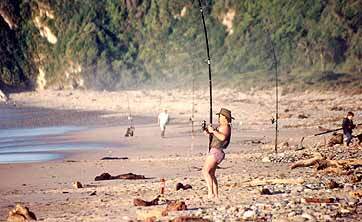 The Hohonu River-mouth is one of the best spots for fly fishing but you really need a boat to get there! There is excellent accommodation at Moana with a hotel, motel and camping ground. You can make day trips from Greymouth but it is 31 miles away by road.